The FAPI-FINITUBE pipe belt grinder is a very sophisticated machine with an extravagant design and offers a multitude of new advantages for the user in pipe processing. Numerous prototypes and intensive practical tests were carried out during the development of the FAPI-FINITUBE pipe belt grinder. The result is a harmonious combination of user comfort, innovative design and solid industrial suitability, which guarantees fast and flawless machining of all types of pipes, cylinders or pipe constructions. 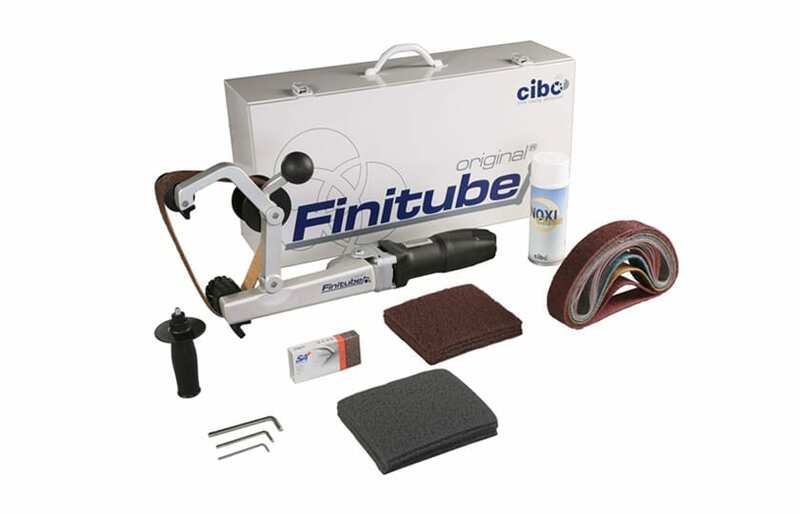 The FAPI-FINITUBE pipe belt grinder has a direct lever drive located on the drive motor. The direct drive makes the connection between the two parts extremely compact and stable. The grinding belt is located in the extension of the machine and is perfectly aligned with the drive motor. This makes the belt extremely stable and easy to run over any tube or cylinder. Thanks to this unique design, the machine is compact and extremely convenient to operate. The direct drive eliminates unnecessary transfer points, making the machine more durable and reliable. 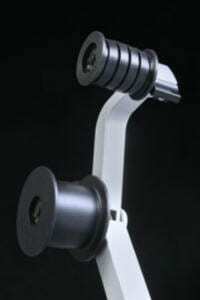 The transmission is also almost frictionless, so it is vibration-free and low-noise. After all, this makes the new FAPI-FINITUBE much easier to maintain. 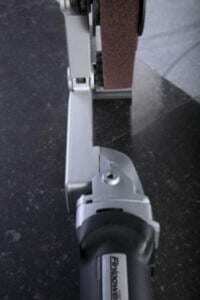 Under the lever extension there is a foot made of impact-resistant plastic. This means that the machine can be set down without any risk to safety, even when the sanding belt is running – a great plus for user comfort and work safety! The inside of this foot is protected with an abrasion-resistant, quickly replaceable plate made of hardened stainless steel. The quick and easy to open lever is fitted with a plastic block that serves as a bumper. This mini bumper is the key for processing any desired diameter over 125 mm and at the same time protects the workpieces from possible damage by the machine. The FAPI-FINITUBE pipe belt grinder is equipped with three guide wheels. Each wheel has its own structure and technical characteristics. Each running surface has its own pattern. The two wheels are made of abrasion- and break-resistant hard plastic and have specially shaped side flanges. The rubber drive wheel is equipped with V-notches. These notches taper outwards. 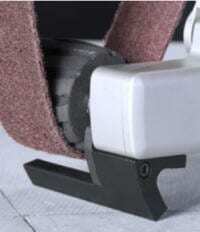 This unique concept offers numerous advantages to the user: It enables a soft and stable belt guidance. 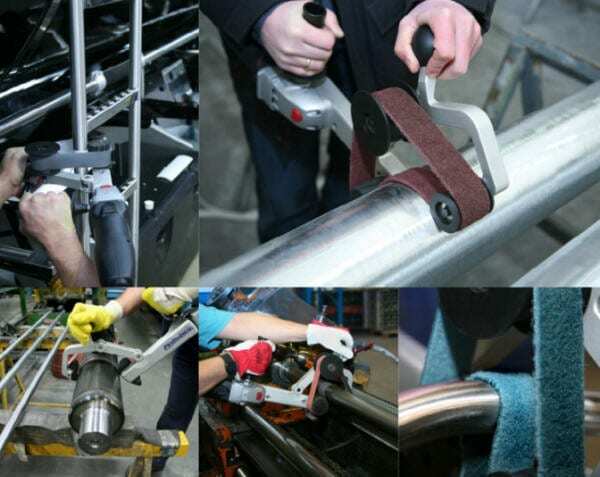 It is virtually impossible for the abrasive belt to slip off the machine, regardless of the position of the machine or user, the pipe diameter or the pipe bend. Even completely inexperienced users can effortlessly machine heavily curved structures with this machine. The V-notches provide a perfect grip without slippage and good cooling, which considerably extends the service life of the abrasive belts used. The FAPI-FINITUBE pipe belt grinder is equipped with an ergonomically shaped handle at the front. It lies very well in the hand, no matter in which position you work. Thanks to the position of this curved handle, relatively little force is required to close the lever completely. The shape of the handle and its position also ensure that the user can almost fully span each tube on his own, regardless of the diameter. The 1,700 watt drive motor has a double gear transmission with very high torque. In order to transmit this power to the grinding belt, a very resistant Multi-V belt with a built-in slip clutch is used. Since the slipping torque of this belt is reached shortly before the highest torque of the machine, it offers optimum protection to both the motor and the operating personnel. With most common pipe diameters, the first step is to reach no less than 270º of the pipe and a full 360º with a simple hand movement quickly and effortlessly. The FAPI-FINITUBE pipe belt grinder is suitable for all pipes, cylinders or pipe constructions made of steel, stainless steel, aluminium, plastic or wood. Large and small diameters, oval shapes, open and closed, straight or curved constructions can be machined with this machine. Particularly popular applications are the finishing of stainless steel railings, balustrades, designer furniture, street furniture, industrial pipes, etc… However, the machine can also be used for more exotic applications such as the machining of aircraft wings, tankers, weaving machines, hydraulic cylinders, sail masts, etc. The machine can also be used for the production of a wide range of other materials. It is also possible to use the FAPI-FINITUBE pipe belt grinder for deburring or grinding welding seams or for removing rust as well as paint and varnish layers.